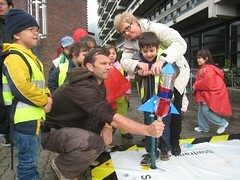 The aim of the project „SoMoSt – Sun, Moon and Stars“ was to interest students of the college for kindergarten-education in Innsbruck for science (biology, astrophysics, mathematics) and to show them, how theoretical science knowledge can be used in practice in pre-school and after school care. Sun, moon and stars took the centre stage, and astrophysics and ecology scientists of the University of Innsbruck and the Austrian Space Forum worked together with teachers and students of the college to focus on the universe. Teachers of biology and mathematics were assisted by teachers for education science and didactics, who trained the students for their performance in pre-school and after school care. Multidisciplinary work and involvement of teachers, students, scientists, children and their parents hopefully guaranteed a success of the project’s aim to emphasize the importance of science in pre-schools and after-school care.